We managed to reach the Maltby stop without further mishap, thankfully, and rolled straight over to the mechanic's tent. Upon seeing us, the mechanic said, "I haven't seen one of those [Opus IV's] in years!" He and several other cyclists were all heartily amused by the contraption. We were relieved to have reached the mechanic, but received disheartening news: although the mechanic had a couple of 26-inch tubes, he wasn't carrying any 26-inch tires with him. You see, on rides like the RSVP, the vast, vast majority of riders aren't so foolish as to ride on mountain bikes with 26-inch wheels. It was a repeat of my experience in Arizona several years back, where on another occasion I found myself riding along with badly-worn sidewalls on a bicycle with 26-inch tires (the Jolly Roger, natch). 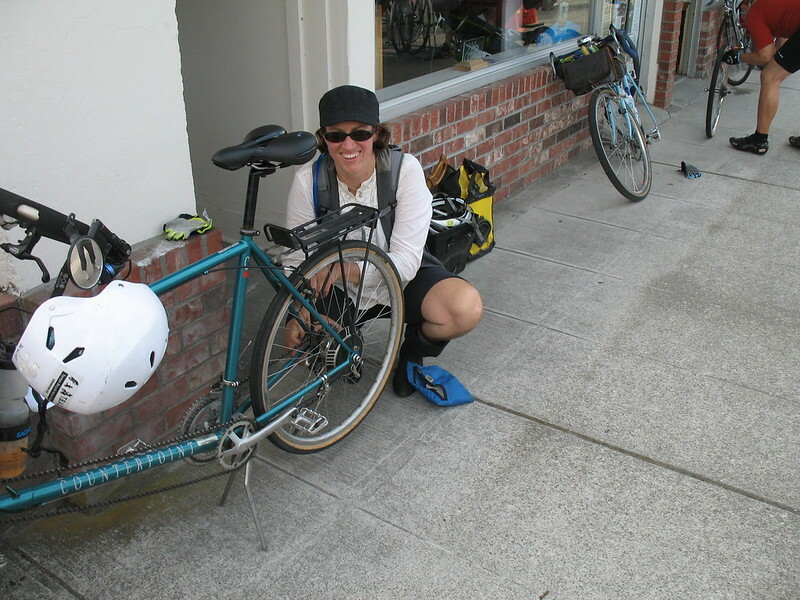 On that adventure, which I nicknamed the BS-150 (because I was riding as a support squad for friends doing the MS-150), I'd had similar bad luck finding a new 26-inch tire, and wound up flatting 4 times on my way back to town before I encountered a bike shop. Regardless, we soldiered on. We enjoyed the perfect morning weather and the smell of ripe blackberries as we pedaled along the Centennial Bike Path. Our next stop was in Machias, where there was also a mechanic on hand. As soon as we arrived, I made a beeline over to the mechanic's tent. Once again, disappointment: no 26-inch tires in sight. There was nothing to do but drown our sorrows in peanut butter and jelly sandwiches garnished with chocolate sprinkles. From Machias, S took a turn at the helm of the Opus IV. We continued along the Centennial Trail Bike Path towards the lunch stop at Arlington, where we held out hope that the brick-and-mortar bike shop would actually be open. Given our general state of affairs, I tried to caution S against racing along at 17 miles per hour on the Opus IV, figuring lower speeds would put less stress on the ageing tire. Regardless, for one reason or another, we found ourselves suffering through a second blowout just four miles short of Arlington. Back to work I went, removing the wheel, installing a fresh tube, and repositioning the tire boot, which had somehow managed to travel away from the problem site. Finally, Arlington at last. After brief confusion, we headed for the bike shop. Finally, luck was on our side. They had one 26-inch tire in stock. While everyone else scouted for lunch, I set to work again, replacing the worn-out junky garbage tire. Several minutes later, I wasn't smiling anymore. The extra exertion from pedaling the Opus IV, combined with our tire blowout delays, made us late for lunch, and my old nemesis El Crampo decided to show up. Much like "bonking," the main cure for El Crampo is time. In the meantime, the effect of El Crampo is worse, because it involves writhing around on the ground by the side of the road or in a ditch while suffering through the pain of a severe intestinal cramp. A fate best avoided. Thankfully, a huge tray of Mexican food seems to be an adequate cure. I don't remember much about the subsequent rest stops in Mt. Vernon or Allen Park. All I know is our various delays put us towards the back of the pack among the stragglers as the afternoon wore on. But really, there are worse places to be. Eventually we reached the final stretch of the day, along Chuckanut Drive. For me, it was glorious, because I was able to soft-pedal on the Jolly Roger while S and my dad stormed up the hills. The rolling hills, ocean views, and deep woods made my heart happy, and I could almost just reach out and grab the ripe blackberries, they were so tantalizingly close. Finally, we arrived in Bellingham. There was a bit of confusion navigating to my friends' house, but that was more than compensated for by the amazing feast they prepared for us, and their wonderful and understanding company for this bunch of tired cyclists. We did it - we survived the first day. And it only took us 13 hours altogether, to cover that first 100 miles. *You'll notice there aren't many photos from this ride because it was just too much to manage a camera on top of everything else. Oh well. This entry was originally posted at http://rebeccmeister.dreamwidth.org/1174685.html. Please comment there using OpenID.